Today's smartphones are becoming more and more water resistant but it is still best to keep them dry to avoid damage. This is a guide about keeping your cell phone dry. If you are out on the water, particularly in smaller vessels such as jet skis, canoes, kayaks, etc., take note of the following tip. Place your cell phone inside a drink cozy and then place inside a plastic zip top bag. 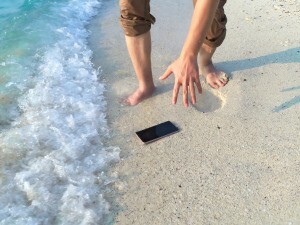 This way should your cell phone take a dive in the water, it should float as well as stay dry. I've heard of keeping your phone in a plastic bag, but the drink cozy to keep it afloat is a grand idea. Brilliant and original thinking! I've got to remember to spread the word to my family.